This is really quite astounding. 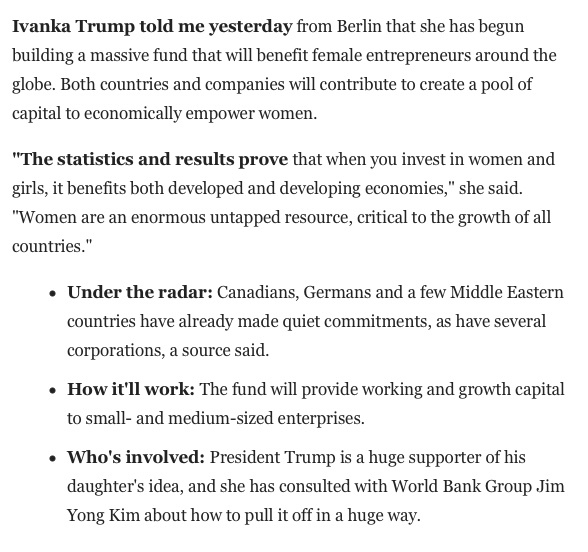 In this morning’s edition of Mike Allen’s not-Playbook from Axios he introduces what seems to be Ivanka Trump setting up something that sounds a lot like the Clinton Foundation, only in this case run from within the White House by a top presidential aide who is also the President’s daughter, who also runs her own large international company and who also has two brothers who are currently running the President/Father’s company and trying to rake in as much money as possible on the fame and power of the presidency. Also, let’s be honest, the Trumps are a notoriously corrupt family, especially when it comes to running foundations. No less astounding is that Allen never mentions that there’s anything problematic about this or that it doesn’t mimic in a wildly more corrupt way what President Trump nominally ran most of the 2016 campaign against. What’s worth asking is this: Is this even envisioned as a foundation and non-profit? Or is Ivanka setting up something like a venture capital or private equity fund? i.e., one designed to make a profit?